In addition to sharing its first single, "Green Light," earlier this week, Lorde disclosed several new details of her sophomore album in an impromptu Q&A on Twitter. 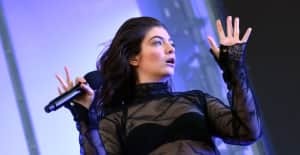 Melodrama, which she co-wrote and produced in its entirety with Bleachers' Jack Antonoff, still has no announced release date, but, according to Lorde, it's going to be true to its name. She ensured fans it'll include at least a few tearjerkers, and also that there's plenty of material that wasn't quite melodramatic enough to make the cut. Fans of her upbeat, playful cuts like breakout hit "Royals" need not fret, however, as she also stated that it won't feel too far afield from her critically acclaimed debut LP, Pure Heroine, from 2013. One thing we know for sure that the two albums have in common is that Lorde's voice is the only one on wax, thanks to her to-the-point "no features" response to a curious fan.